By the way, this year's Oscars are going to be awesome, because Emmanuel Lubezki is finally going to win, and for a Malick film! Anything that annoys you about the awards trudge season in the next six weeks, just think about that. Jan. 18: Predictions in below-the-line categories added. Jan. 23: Last switch, Beginners for 50/50 in Original Screenplay. 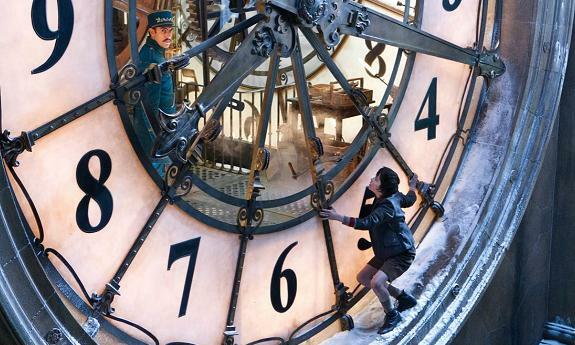 PICTURE: The Artist, The Descendants, The Help, Hugo, Midnight in Paris, Moneyball, The Tree of Life, War Horse Missed: Extremely Loud & Incredibly Close 8/9! Anything Else to Consider? Bridesmaids was my closest runner-up in my previous attempt at predicting, because the people who love it, and there are a lot of them, may well rank it first: for affection-based reasons and from a temptation to endorse career opportunities for women, especially in comedy. It's harder to leave out than it was last time, just as it's harder to leave in The Tree of Life and War Horse, but I'm sticking with the same line-up. The Malick has even more passionate devotees than The Thin Red Line did in 1998, and War Horse feels like a rallying-point for whomever pushed, you know, The Cider House Rules and The Green Mile across the line. Tinker Tailor Soldier Spy and, even more so, The Girl with the Dragon Tattoo have suggested estimable fan bases and hit audiences at a good time for nomination recognition. They are feasible nominees, but I'm still not feeling it. Still no idea what to think about Ides of March. Anything Else to Consider? I have dropped Terrence Malick for Allen, whose nods from the Globes and the DGA bode well, as does the fact that his previous nomination was even longer ago than Malick's. I still desperately want to go out on a limb for Asghar Farhadi, especially as I now hear Separation screeners went out really early: great move, Sony Pictures Classics! I imagine, though, that Miller will draw huge support not just from Moneyball's many, many fans but from people who admire him for salvaging the project from abortive ruin, and in such an easy-breathing, audience-stroking way that still emits credible personality. If they went for him for Capote, which was colder and made a tenth as much money, why wouldn't they here? Meanwhile, Payne movies have repeatedly done less well with AMPAS than in precursor seasonno script nod for About Schmidt, no Giamatti for Sidewaysso I'm hoping that he's vulnerable. Even though I'm sure he isn't. Anything Else to Consider? After the frontrunner trifecta, the last two spots go to some combo of Close, Rooney Mara, Tilda Swinton, and Wiig: three women who went to bat for long periods and in multiple capacities to get their movies made, plus Mara, the quasi-overnight sensation. Mara's movie dropped at the right moment, and her reviews are even stronger than the film's. Perceptions that she's been prickly or presumptuous in interviews might matter more, and without the extra force of a "Scrappy Novice Pulls Herself Up By Her Bootstraps" narrative that served Lawrence, Sidibe, et al, she looks a bit like a 1%er in a big fat studio movie. Surely more tempting to AMPAS, which is full of people in Close's age-range, to reward 30 years of project development and general fondness for an un-Oscared vet, even if they don't watch or like the movie? And easier, I think, to thank Wiig for writing herself a sensational vehicle (boy, do they love actors who do that) and for making something so profitable that a lot of other people might get more, better, and/or funnier work because of it. Between popping in a Bridesmaids screener or a Kevin screener, what would Ernest Borgnine do? Or Sid Ganis? Or indeed, Rooney Mara? (Okay, Rooney would watch both.) Or, having run out of time to watch all your screeners, you vote for the funny, bank-making bridesmaid and the five-time Oscar bridesmaid, right? Anything Else to Consider? I'm dropping Fassbender for Oldman. Shame is really divisive and a harder movie to get people to watch, surely, than Tinker Tailor, though both feel like modest hits in proportion to their scales. Plus, "let's make Fassbender happen" and "let's act like we've always supported Oldman" seem about even to me as narrative hooks. Shannon's hook still seems even better to me: an open-ended, all-American indie that invites you to participate in it, especially at the end, whereas the other two sort of expect you to be fine with feeling frozen out. Demián Bichir's SAG nod doesn't seem to have produced a lot of buzz, and Gosling's vehicles didn't land in a "Best Actor" way, even if he owned the year. Rescidivist, old-guard Clint-worship makes DiCaprio the only other spoiler I'm really wondering about at this point. Anything Else to Consider? I'm dropping Janet McTeer for Chastain, in a very competitive heat. Almost dropped McCarthy instead, but felt odd projecting Bridesmaids to gain heat elsewhere and lose it where it's actually had some. (Then again, only some.) With six more or less neck-and-neck performances, I'm assuming that the best-loved movies have the edge. Does anyone like Albert Nobbs as much as the Help, Descendants, Bridesmaids, and Artist factions love those show-ponies? Anything Else to Consider? Short of Patton Oswalt or mayyyybe Ben Kingsley elbowing in on Jonah Hill's action, I just don't see a lot of movement in this race. If you don't live in New York or Los Angeles, Extremely Loud & Incredibly Close still feels more like a myth, and a widely-loathed myth at that, than a movie. Obviously, those two markets are the only ones that really affect Oscar-nod outcomes, but even there, does anyone still think Max Von Sydow is happening? I wish Mortensen felt more likely, but people aren't talking much about the movie, even though it's holding up as best as can be expected (though no more than that) given the currently glutted market. Caesar and Uggie can stroke each other's fur consolingly in the corner. I know, I know, chimps have hair, not fur. Whatever. A commenter reminded me about Nick Nolte, whom I admit I'd forgotten about, and he has definitely been pulling down some nominations. But if I liked Warrior and I'm an awards geek, and I forgot about him, what does that say about the heat around his performance? Predictions always look like one-third a plausible Oscar scenario, one-third a reflection of what idiosyncratically resonated with you about past Oscar rosters, and one-third what you're loving or hating at the moment you predict. I'm sure this is the case here. Anything Else to Consider? Tinker Tailor Soldier Spy feels very competitive, and Harry Potter, Drive, J. Edgar, and Moneyball are not out of the question. Anything Else to Consider? I've only seen half of those, so I'm picking a little blindly, with We Were Here, Buck, Undefeated, Jane's Journey, and others posing serious opposition. Anything Else to Consider? This race feels as crammed with full-tilt possibilities as it did in 2008, when Woody Allen got blanked for Courtney Hunt and Martin McDonagh. I'd put 50/50, Take Shelter, and Win Win as the most likely spoilers, with Margin Call and Margaret after that, and Young Adult still hanging on. Anything Else to Consider? I can't figure out whether Hugo or The Help will lose a spot to Ides of March; possibly neither of them will, but Ides just seems so Writer's Branch-friendly and the two Hs don't. The Girl with the Dragon Tattoo and War Horse pose outside threats, but does anything else? Anything Else to Consider? Puss in Boots probably makes more sense than the more outré Chico pick, but especially when the overall field has proved uninspired, this branch has proved susceptible to Secret of Kells-style surprises of late. Winnie the Pooh, despite great reviews, and Rio, despite great box-office, haven't had any luck on these rosters so far this season. Anything Else to Consider? Monsieur Lazhar and Seediq Bale feel like strong plays, and people who have seen Bullhead seem quite enamored. I'm not even sure I can work out which of the three semi-finalists are the Executive Committee's pet causes. Omar Killed Me feels like the straggler to me, but after Zem's multi-faceted career, I'm pleased for him. Anything Else to Consider? War Horse and Tinker Tailor are the most considerable threats outside this list, I think, but fondness for the former seems mo muffled, and the confusing plotting of the latter is surely down to the editing as much as anything. And how many quick inserts of portentous-looking faces do we need? Best Picture heavyweights should always be considered here, and the Descendants team is pushing hard for a nod. Tintin's action set-pieces might impress, too, though even in this field, animation and motion-capture have some high hurdles to clear. I'd have thought well-liked action blockbusters like Rise of the Planet of the Apes, Super 8, or Harry Potter might stake a claim here, but the A.C.E. ballot suggested no enthusiasm. They didn't for Ghost Protocol, either, but after the swell box-office and the dazzling set-pieces, can it really be ignored? Anything Else to Consider? Note that, without trying, I am duplicating the BAFTA list. I realize the Guild conspicuously omitted War Horse from their own nominees, and maybe I ought to take the hint, but is Spielberg really to be overlooked for the Elizabethan dioramas of Roland Emmerich's team in Anonymous, or the cool appeal of Dragon Tattoo, or the Disneyfied South of The Help? Possibly, but hard to believe. Anything Else to Consider? My Week with Marilyn might get by on period setting alone, and for padding out Michelle Williams' figure, even though the costumes are nothing special. Troy Syndrome could always yield a crazy-good nod (Immortals? ), a crazy-dumb one (Pirates? ), or just a crazy one (W.E.?). Thor might be the most Troy-ish contender of the lot, and the Guild went for it. I thought A Dangerous Method had some of the year's best tailoring and most character-specific designs, but Oscar has never once sprung for Denise Cronenberg. J.Edgar's not impossible, but has its fan base, if it ever existed, withstood a sparkless season? Anything Else to Consider? Once again, turns out I'm repeating BAFTA. First, if The Descendants qualifies here, please somebody swing by and check my pulse. Anything Else to Consider? I hesitate at ignoring The Artist and at suppressing my own desires to see Hanna in the mix (heh heh). War Horse, Tintin, Fast Five, Harry Potter, and Rise of the Planet of the Apes must be tempting choices for the pop crowd. Tinker Tailor and Rango certainly deserve consideration for fans of subtlety and idiosyncrasy. Girl with the Dragon Tattoo will draw at least a few votes from both factions. Moneyball scored a nod from the Cinema Audio Society; I can't work out why, but I'm glad to hear support for the movie is broad, even in unexpected quarters. SOUND EDITING: The Adventures of Tintin, Fast Five, Hugo, Rise of the Planet of the Apes, Super 8 Missed: Drive, Girl with the Dragon Tattoo 1/5! Anything Else to Consider? I'm sure I'm over-estimating the differences between the Sound Mixing and Sound Editing rosters, although the nominators in the Sound branch have been refreshingly willing to do this of late. Animation tends to do well here, and while I'm rooting for Rango to get the nod, Tintin is fresher in the mind. All those car noises in Fast Five and chimp-screeches in Apes seem tough to avoid; The Artist, for its belated but witty sound elements, and Hugo, given its loudness and density, could lend the category some Best Picture prestige. M:I-4, Pirates, Transformers, Harry Potter, Super 8, and War Horse will make major pushes to unseat one, two, three, or more of these picks. I frankly won't be stunned if I'm wrong across the board. Anything Else to Consider? Betting against the Best Picture front-runner is probably folly, and betting against two of them is probably... follier? I think The Artist has a much better shot than Hugo. In fact, I'd be less surprised to see Harry Potter or Albert Nobbs than Hugo. Gainsbourg: A Heroic Life is the hardest semi-finalist to gauge, since AMPAS has opted more than once for this kind of off-the-radar title when the work is good enough. Anything Else to Consider? The branch has tipped five other semi-finalists (M:I-4, Pirates, Real Steel, Tree of Life, and X-Men). The Tom Cruise box-office juggernaut could easily crash the front-runners' party. I hate leaving off the engrossing cosmogony and nanobiology in The Tree of Life, but it's the sort of Visual Effects work critics and Oscar nods love to endorse and Oscar never does. The other three I'm not particularly worried about, though not having seen Real Steel or Pirates, which made a lot of people a lot of money, I'm perhaps being cavalier. Anything Else to Consider? The In the Land of Blood and Honey track? The novelty number from Captain America? The Elton John drivel? I don't enjoy thinking about this absurdly capricious category. "Does anyone like Albert Nobbs as much as the Help, Descendants, Bridesmaids, and Artist factions love those show-ponies?" Such a logical assumption that makes me immediately think that it won't wash with voters because I thought the same thing with Invictus and voila too nominations for sleeper performances. Although, Close and McTeer >>>>>>>>>>> Freeman and Damon, generally and specifically for those performances. I'm surprised you don't even mention Nick Nolte as a dark horse in Supporting Actor. Sure, "Warrior" was (unjustly) a flop, but he's a multi-nominated veteran and has good precursor support, and it's a very Oscar-y role. Plus, it's actually a very good performance. I feel more confident about him than I do about Brad Pitt or even Jonah Hill. Other than that, great list. But I hope you are WRONG WRONG WRONG about Fassbender (and I mean that in the nicest way possible!). I love that you are informed even about Mara's interviews rumoured behavior! I had read nothing but I've been avoiding her ever since I couldn't get why you all liked her in Social Network. That said, I'm sure the rumours are true. She seems like a horrible person. OK, not really, but I like to imagine that. Maybe I'm a horrible person. "By the way, this year's Oscars are going to be awesome, because Emmanuel Lubezki is finally going to win, and for a Malick film!" I admire your optimism, and shall buy you a drink to ease the pain after Guillaume Schiffman (or, God save us, Jeff Cronenweth) takes it away from him. I'd really like to see her get nominated for "Take Shelter," as I thought that was the best of her roles that I've seen (haven't seen Coriolanus yet). "And maybe a live-blogging of the Globes? Just saying :)"
And it would be great if A Separation got a script nod but I think Young Adult is too popular to miss.